LG's latest ICS-laden phones are graced with the handy QuickMemo app, which allows you to doodle and write stuff directly on the current screen you are at for quick reminders. The app has its own on/off toggle in the pull-down notification bar, and comes in pretty handy when you just want to scribble a few words on any screen for a quick reminder later. You can choose brush sizes, colors, and so on, and annotate web pages, photos and text. Today LG announced that it is bringing the app to the US, and will be first integrating it in the LG Viper, which will start receiving it next Monday, July 16. 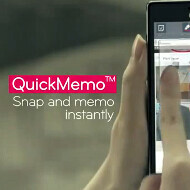 Afterwards the company plans to bring QuickMemo to all LG smartphones in the US by year-end. Watch a promo video for QuickMemo below. Am I the only one who doesn't use memos on phones?